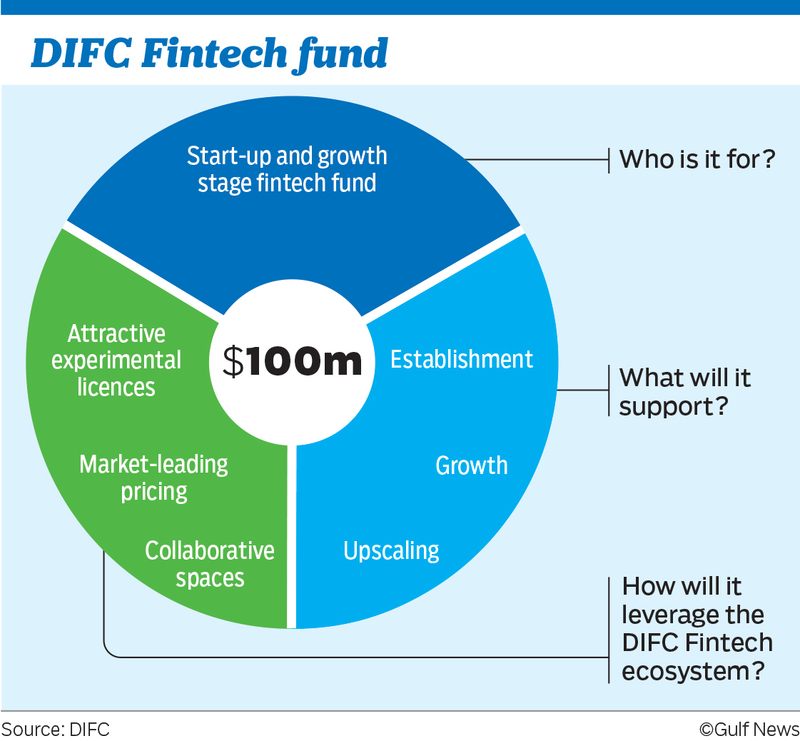 Dubai: Dubai International Financial Centre’s (DIFC) new $100 million (Dh367 million) FinTech fund, which will come from internal resources, will support Fintech Hive start-ups in Artificial Intelligence, blockchain, robotics, DIFC governor Essa Kazim said on Tuesday. He was speaking at the Global Financial Forum, which was opened by Shaikh Maktoum Bin Mohammad Bin Rashid Al Maktoum, Deputy Ruler of Dubai and the president of DIFC. DIFC thinks that fintech is “underserviced” and the allocation of funding going into this new business is “very very limited” in the MEASA region, accounting to less than 1 per cent of the total. The fund can grow bigger, Kazim said. “We have been talking with some government departments at federal level, or local level. If the interest materialises into anything then definitely the structure of the fund will be different,” he said. “We don’t mind having other entities mainly government or semi government entities to participate in this fund. Today the fund is sufficient to support our own initiatives whether it is development of Fintech hive, the type of companies that are going to be supported by accelerator,” Kazim added. The 2024 strategy, which was a 10-year plan of the DIFC to triple its size, was launched 3 years ago, but Kazim didn’t envisage that Fintech would have been a part of the strategy, when the announcement was made. “There is a new order that global financial services industry needs to navigate … the new alliances are being forged. The rapid emergence of advanced technology in all areas of finance is creating shifts like never before in the industry,” Kazim said. Updating on the achievements made so far in the 10 year strategy rolled out in 2015, Kazim said “We are on track (in terms of meeting targets for the 10 year strategy). In certain areas we have passed our targets, but other areas we are lagging behind in area of employment. Although the number of licenses are on track attracting companies, but there is a little lag (not significant) in terms of employment,” said Kazim. Falling oil prices has not been a negative for the center to attract businesses. Before the drop in oil price, the DIFC licensed 150 companies a year on an average, after that the average jumped to 300 companies. “That (funding) element has encouraged banks to really expand their balance-sheet and provide credit to regional governments. Governments have been active in issuing bonds and sukuk and that also encouraged financial activities in the DIFC,” Kazim said. DIFC also hopes to attract more asset managers, financial institutions from India and China. Dubai Aviation City Corporation (DACC), which is the licensing and regulatory body for Dubai South free zones, has announced that freelancers can now avail the opportunity to work under a freelancer work permit. The initiative is in line with global trends of a growing number of professionals that are seeking work options that have flexible working hours and work-from-home agreements, said a statement. This new development reflects Dubai South and DACC’s commitment to help position the emirate as the most innovative business hub attuned to the modern needs of both companies and the workforce in line with the directives of HH Sheikh Mohammed bin Rashid Al Maktoum, Vice President and Prime Minister of the UAE and Ruler of Dubai, it said. Dubai South continues to build new initiatives that support businesses in Dubai to maintain its global attraction as a magnet for foreign investors, it added. The emirate is strategically positioned in key sectors surrounding innovation and digital technology such as e-commerce, AI, blockchain and fintech, following 26 per cent increase of foreign direct investments (FDI) during the first half of 2018, reaching Dh17.7 billion ($4.81 billion). Dubai South’s ongoing initiatives are further boosting the business activities of its partners which include startups, SMEs and multinational companies, and most recently, individual professionals in specialised professional sectors. “Considering the ever-evolving business landscape, policies and strategies from 10 years ago had to undergo huge transformation to adapt to current trends and meet the needs of businesses. We are keen to be on top of leading efforts that meet the needs of today’s SMEs, startups as well as individual professionals seeking independence through a range of customized solutions that will further hep them grow their business,” he added. The new scheme is expected to widen the scope of income sources for professionals in Dubai and the UAE and take advantage of the business opportunities within Dubai South. Among other initiatives, the Business Park continues to boost the role of multinational companies (MNCs) and connect them with SMEs at Dubai South Business Park through various engagement sessions, including periodic workshops. The Business Park is home to some of the leading international business organisations such as the Japan Trade Center, Chinese Business Hub, and Queensland Australia. Business entities also enjoy a range of incentives such as rent reduction from 5 per cent up to 25 per cent for existing and new tenants in line with customer loyalty program, leading to 85 per cent tenants’ retention. It also allotted 10 per cent of its annual procurement and projects to Dubai-based SMEs, including more than 25 per cent reduction on annual rent. The latest initiative defines a freelancer as a sole practitioner who conducts his business in his birth name as opposed to a brand name. Freelancers, who manage their own schedule, will have the flexibility to choose the company they work with and the projects they accept. When applying for a work permit in Dubai South, they must be a degree holder and they should submit a professional certificate or proof of relevant freelance experience. The guidelines also state that no lease is required to be granted the permit and benefiting from the free zone privileges while maintaining a sustainable business environment and three years visa.